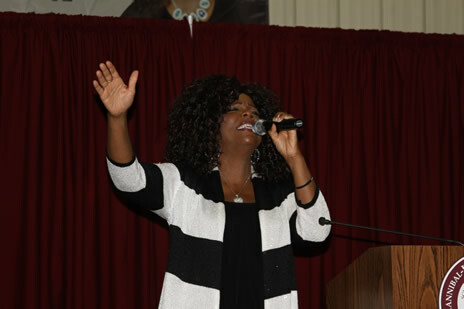 Over 400 people were in attendance to hear gospel singer Lynda Randle speak and perform a mini concert during the 72nd annual Booster Banquet on Friday, November 22. Lynda was born and raised in Washington, D.C. Growing up a part of the D.C. inner-city culture, Lynda experienced the pain and anguish that can rarely be imagined by the majority of Christian-America. Since giving her life to the Lord Jesus Christ, He has used the scars of her youth to bring a distinct depth and richness to her ministry. Lynda’s distinct alto voice has created opportunities for her to minister across the United States and around the world. Lynda shared her life’s story and emphasized the importance of attending Christian schools and universities. “I don’t know where I’d be if not for attending a Christian University,” she said. Lynda also read a children’s book she wrote entitled “The Cab Driver’s Daughter.” Through it she was able to share the story of how Jesus spoke to her father through a Christian radio station he was playing while driving his cab in Washington, D.C. and how his surrender to the Lord healed her broken family. The story went on to tell about how she, as a young girl, got into the wrong crowd and started living a very rebellious life. After she failed the 9th grade, her parents decided to send her to a Christian School. She fought it and fought it, but eventually her heart changed. Soon she started singing and throughout the years, the Lord kept opening doors for her to sing all over the country and the world, a girl who had started out as just a cab driver’s daughter. Songs that Lynda sang throughout the evening included “Just a Closer Walk with Thee,” “He is There,” “God of the Mountain,” “It is Well with My Soul” and a song entitled “He Will Carry You” in which the HLGU Concert Choir accompanied her. Attendees of the Booster Banquet were also able to hear from two of HLGU’s students, Bryce Kelly and Reid Echelmeier. Both shared about how they felt the Lord leading in their lives to attend Hannibal-LaGrange University, and what a difference it has made to them. All in all a great evening was had by everyone in attendance. Next year’s banquet will be held on Friday, November 21, 2014. For more information about HLGU’s annual Booster Banquet please contact Director of Alumni Services and Institutional Advancement, Lauren Youse at 573.629.3126 or via email at lauren.youse@hlg.edu.